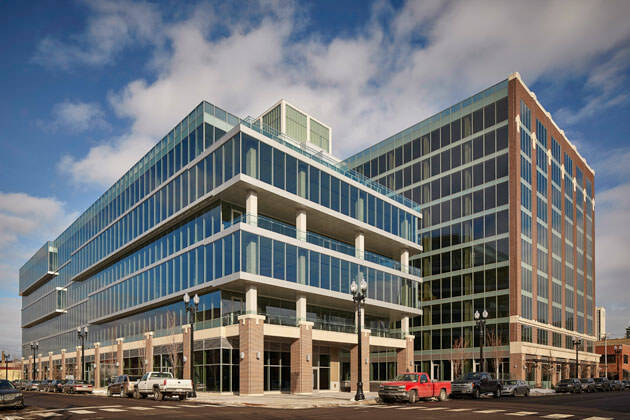 1K Fulton was honored as Redevelopment of the Year at the 27th Annual Chicago Real Estate Awards. The annual awards program recognizes the industry’s best design professionals, contractors, developers, and property management and representation teams. Held on March 5, 2015, at the Hilton Chicago, the event was attended by more than 1,800 guests and raised more than $1 million for the Greater Chicago Food Depository. 1K Fulton is a mixed-use high-tech office and retail development located in the West Loop’s Fulton Market district. The project, developed by Sterling Bay, with HPA as architect and Linn-Mathes as general contractor, is comprised of the adaptive reuse of the Fulton Cold Storage Building, a 10-story concrete loft building constructed in the 1920’s, and new construction of a six-story contemporary annex. 1K Fulton is being cited for the transformative effect it will have in drawing new retail options and hundreds of professionals from Google, SRAM and other tenant firms to Fulton Market. The honor marks the third year in a row that an HPA-designed project has won a CCRE project award. Development of the Year was awarded to Harper Court in 2014 and to 1225 Old Town in 2013.